On Friday, President Trump announced a deal with congressional leaders temporarily ending the federal shutdown and opening the government for three weeks while debates over border wall funding continue. 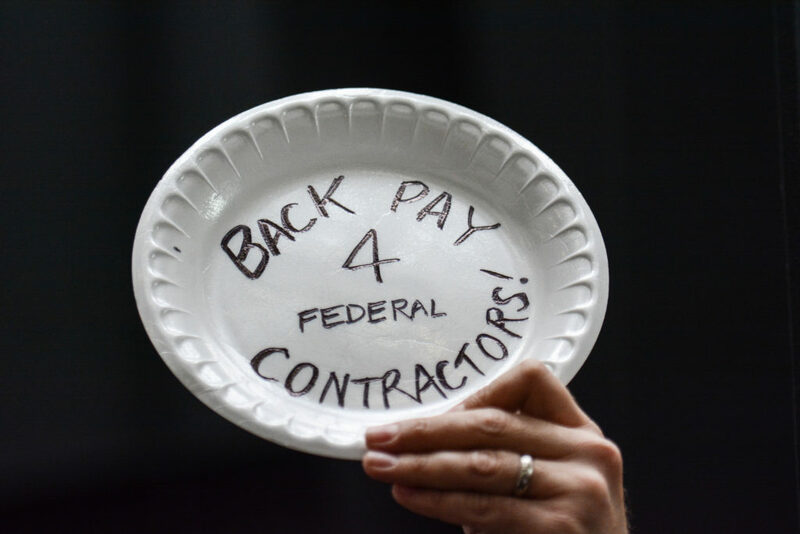 Although Trump promised backpay for 800,000 workers “very quickly or as soon as possible,” federal contractors who are employed indirectly by the government are not guaranteed compensation. The uncertainty leaves thousands of contractors in the Washington region short of pay. Kojo speaks with a federal contractor about the impacts of the shutdown and a union leader representing other federal contractors. KOJO NNAMDIYou're tuned into to The Kojo Nnamdi Show on WAMU 88.5. Later in the broadcast, D.C. United will now exclusively air its games on a subscription streaming service. What does that mean for current and for future fans? But first, after President Trump and congressional leaders reached a deal on Friday to reopen the federal government after a 35 day shutdown, federal employees affected learned that they would be getting back pay, but federal contractors soon found out they weren't included in that deal. KOJO NNAMDIJoining us now to discuss this is Jaime Contreras. He is the Vice President of 32BJ SEIU, a union that represents many federal contractors. Jaime, thank you for joining us. JAIME CONTRERASThank you for having me. NNAMDIAlso with us in studio is Devon Russell. He is a security officer at the Smithsonian Museum of Natural History. Devon, thank you for joining us. DEVON RUSSELLThank you for having me as well. NNAMDIDevon, where were you when you learned about the deal to end the federal shutdown, the longest in the nation's history? RUSSELLI was actually at home. My last official work day was January the first. But since that was my off day, it didn't actually kick into that Wednesday, which was January the second. So I was at home when I found out the information. RUSSELLDefinitely so. I was surprised. RUSSELLWe've had shutdowns before, but we've never had anything such as this magnitude go on before. So I was going on thinking that it wasn't going to be long and it turned out to be over a month. So I was definitely shocked with this government shutdown. NNAMDIYou weren't trying to get your hopes up too soon. And what has those past 35 days meant, been like for you and your family? RUSSELLIt's been a mess, because, you know, every working person has bills to pay. I have a three year old daughter I have to provide for. So as far as this government shutdown goes, I've definitely been forced to pick and choose which bills I wanted to pay during this government shutdown. So it's been crazy. NNAMDIWhat does the deal mean for you now? Are you back at work? RUSSELLI will be returning to work this upcoming Wednesday. So I will be back to work this week? NNAMDIWhy not today or tomorrow? RUSSELLThese are -- with me working before the shutdown, Mondays and Tuesdays are my days off. So I don't return back until Wednesday. NNAMDIJaime, did you anticipate federal contractors being left out of the deal to end the shutdown? CONTRERASYou know, we've been through this before in history, but, you know, as workers who work for contractors in the federal government don't get paid. It's a disgrace. And, you know, we -- our union represents over 2,000 federal contracted out workers in the D.C. area of which 700 or so were affected by this longest government shutdown. They haven't gotten paid in the past. So we know that they weren't going to get paid this time unless Congress, you know, passed the legislation or the easier thing to do is for OMB to direct the agencies to pay these contractors. The agencies have, you know, they have discretion over whether they pay people or not, but they have to get direction from OMB. NNAMDIWhat's the technicality involved? I think a lot of people don't understand why it is that a large group of people were put out of work by the partial shutdown. One part of that group will be getting back pay. The others because they are not technically employed by the federal government won't. Yet they have union representation. CONTRERASCorrect. I mean, you know, it's bureaucracy. It's really -- I mean, these workers work side by side with the direct federal employees, who work directly for the federal government. These are people, who secure our buildings like the Smithsonian. These are people, who keep all the federal buildings in the D.C. area clean, where the federal government employees work. There's no reason why these workers shouldn't be considered federal employees other than the fact that they work for a federal contractor. If the contractor doesn't get paid, the workers don't get paid and that is disgraceful and we're trying to fix that. NNAMDIJaime Contreras is the Vice President of 32BJ SEIU, a union that represents many federal contractors. He joins us in studio with Devon Russell, who is a security officer at the Smithsonian Museum of Natural History. Here now is Steve in Fairfax, Virginia. Steve, you're on the air. Go ahead, please. STEVEHi, good afternoon. I've been through this in the military and as a civilian federal employee and I've had contractors I've worked with and who have worked under me that have really been badly affected by this. And I think it's a real problem. In a short term, if the government were to end the ability to do the shutdown as political hostage taking, that would solve the problem. But I think this is part of a larger problem that the federal government hasn't increased its population in several decades and it outsourced a lot of stuff to contractors as opposed to having more federal employees. STEVEAnd there are reasons why we do that and very legitimate reasons. But we, I think, have abused that, because it's easier to do that instead of actually hiring and explaining why we need more bodies to do jobs. And so we end up in a position where all of these contractors are. They're a service. They're not a person. I find that personally to be (censored), because I work next to them day in and day out. And they get adversely affected by things like this and I think it's quite frankly absolutely wrong and should be addressed. NNAMDIDevon, do you do anything significantly differently from the federal workers you work alongside with day by day? RUSSELLNo. It's the same type of work. The only thing that's the difference is the ones that are employed directly for the government. Those are the armed officers. But other than that there is no difference. NNAMDIHere now is Brian in Leesburg, Virginia. Brian, you're on the air. Go ahead, please. BRIANYes, good afternoon. One thing that concerns me or angers me even is my wife is a government contractor. She does her own independent contracting with the government and she lost some clients' work, you know, during this shutdown. But the part that, you know, that is -- I don't know angering is that the past two years it's been all the of the same party in the House and the Senate and the President. BRIANAnd this issue wasn't as big or as brought up as large as it is right now. And as soon as we are no longer in a single party, they expect to get it done within these three weeks that they haven't been able to do for two years. And it's almost a farce just thinking that they're going to be able to come to an agreement that fast, but couldn't do it after two years. NNAMDIThank you very much for your call. Care to comment on that, Jaime? CONTRERASI mean, you know, we're hopeful that they will be able to come to their senses and put really, you know, people and country before ugly politics, which is hard to do in this environment. You know, but we're standing strong with all federal workers direct and contracted employees. And, you know, the reality is, you know, most people in America don't support a divisive wasteful wall. CONTRERASAnd the thing is if we give in to the wall now, what is this president and this administration going to come after, Healthcare, Social Security. We have to hold the line somewhere. And I think our friends on the other side are doing just that and, you know, we commend Nancy Pelosi in the House for doing that and the Senate as well. NNAMDIAs a leader at 32BJ SEIU, do you have a plan to get back pay for federal contractors? And if so, what is it? CONTRERASYeah. So we're asking -- right now, we have two bills, one in the House, one in the Senate. One is led by Congresswoman Diana Presley and others from Massachusetts and other places. That's on the House side. And we also have Chris Van Hollen and other senators, all the senators from this area and other senators around the country also pushing for a bill on the Senate side to make sure the contracted out workers get paid. CONTRERASWe're going to be doing rallies, press. I mean, you know, these workers have been to Mitch McConnell's office and sat down and did a round table with a bunch of senators to make sure that they understand the plight of contracted out workers and what this means for them if they go, you know, 30 what -- 36, 37 days without pay. It's disgraceful. It's wrong. We shouldn't hold federal workers hostage for political gains. That's just wrong. CONTRERASYou know, why that's allowed under the law, you know, it's besides me. But I think we should take care of this once and for all. No administration should be able to hold federal workers and contracted out federal workers hostage like this president is doing now. NNAMDIAs you're trying to lobby members of Congress, are you seeing that you have allies? You mentioned people who represent this area on both sides of the aisle giving the divisiveness of Congress at this point? CONTRERASYeah, I mean, we know that our democratic friends are standing with our members and with federal workers. I think there are both senators and House representatives on the other side of the aisle. And I know that they know that, you know, they have elections coming up in two years. And they are going to have to answer their constituents when election time comes. And they have to think twice about, you know, shutting the federal government down again in three weeks. That's just insane and it shouldn't happen. NNAMDIHere's Susan in Germantown. Susan, you're on the air. Go head, please. SUSANYes, I've worked for three contractors and for each of them the policy was that we had to take mandatory paid time off for the shutdowns. That meant in 2013 that I earned 15 days of leave a year. And I had to use seven for the shutdown. Now, of course, you know, we have children. We have parents. We need to take time off for various things like that. It's not just a matter of vacation. SUSANThe other is that when they declared President Bush's funeral and the day before Christmas federal holidays, our contractor ordered us to take a day of vacation time for each day. We were not allowed to charge anything to the federal government on those days. So I've been fortunate that I've been able to use leave. But it still means I'm losing, at the end of the year, I'm losing. NNAMDIThank you very much for your call. Devon, did you use leave during the course of this shutdown? RUSSELLWell, with situations like this, me personally, I didn't necessarily want to use any of my leave, because it's very scarce as far as leave goes because as far as vacation goes, we only get 80 hours that we can use throughout the year and seven sick days. Of course, you know, people get sick more than seven times a year. And as far as vacation goes, we really want to save our vacation when we really want to use it to actually take that time off. So speaking for myself and some others that I work with, we would rather save our leave for when we really want to use it rather than something that we can't help with this situation like this. NNAMDIBeing forced to use it during a shutdown. RUSSELLBeing forced to use during a shutdown, yes. NNAMDIHow were you making ends meets for you and your family during the 35 days of this shutdown? How were you paying your bills? How were you handling the healthcare for you and your family? RUSSELLThe first couple of weeks was hard, because I didn't have any other funds coming in. I was a paycheck to paycheck worker. But last week, after putting in unemployment, it finally kicked in last week. So right now I'm catching up with some bills and whatnot. And through being, you know, interviewed with all the media and everything people have been generous enough to send me donations and everything. So I'm definitely on the right track with getting caught up with all of my bills and whatnot. NNAMDIJaime, do you think the public is fully aware that there are people affected by this shutdown that still don't have financial security? The notion is that once you are employed by the federal government either as employee or a contractor, you're being paid well and you should have, oh, six months of savings that carry you through these situations? CONTRERASYeah, well, that's definitely a wrong, you know, idea to have in your mind. So most of our members, who are contracted workers are people who already work two jobs and sometimes three because they clean houses on the weekend, because they're not the highest paid workers in the federal government. And even if you talk to some of the direct employees of the federal government, some of them live paycheck to paycheck, because it's not like the wages are, you know, six figures. These workers don't make a lot of money. CONTRERASAnd when you're talking about custodial workers and security officers, they're at the lower end of the scale. And for people, to assume that these folks are doing okay, it's just wrong. People work two jobs for the most part. These are mostly, you know, people of color, black and brown folks, who work in these facilities. CONTRERASAnd, you know, the fact that they have to be forced to use vacation that they should be using to spend with their families in the summer or whenever they want to take their vacation is just wrong. It's wrong to do that. And, you know, some employers will allow you to do that. And some won't. And that's also a big problem. NNAMDIHere is Kay in Fairfax County. Kay, you're on the air. Go ahead, please. KAYGood afternoon, Kojo. I'm a PTA president for an elementary school in Fairfax, Virginia. And we have been watching on the student lunch accounts. We have students, who are on free and reduced lunch. We even send home some food packages for the weekend. Our superintendent has said that no child will go hungry, but we don't want the parents to come back to a debt on their lunch account. NNAMDIHey, Kay, you're breaking up. And I think we just -- call back on a landline. Then we might be able to hear you better. In the meantime, let's talk with Wayne, who's in Maryland. Wayne, you're on the air. Go ahead, please. WAYNEYeah, hi, Kojo. I was calling to say that there's no reason why financially the shutdown needed to occur. And I think as far as the back pay goes, I think that definitely the contractors should definitely be entitled to that. Once again, there's no financial reason why the contractors should not be paid. You know, the budgets have been already set. The shutdown was totally political and the funding is there to pay the contractors. WAYNETo add another level to it, 1099 contractors don't get vacation days. So someone such as myself, wouldn't be able to use sick days or vacations day. Yet we still have bills that still happen. You know, our health insurance, disability insurance, workmen's comp insurance, things of that sort. So I really hope that there's a concerted effort for all contractors to get paid what they normally would have during this shutdown. NNAMDIOkay. Thank you very much for your call. We got an email from Garrett in Falls Church who says, Many many times the 800,000 number has been used in the media. I'm glad to see you're discussing the contractors. How many are there that are impacted? Also no one had mentioned all of the people impacted that work in the area that don't work directly for either, not only local businesses, but service providers that work in restaurants, Uber drivers, and other gig economy workers. I think estimates of shutdown costs are vastly underestimated. Jaime, when we talked about that 800,000 federal workers, did we include contractors in that number? CONTRERASThat's just direct federal contracted -- I mean, directly federal employees not including contractors. I mean, this shutdown is affecting millions of people. People in small business in Capitol Hill, who haven't seen, you know, folks coming in and out of the, you know, cafes and restaurants in that area. It affects the workers. Some of those workers, who work in some of those restaurants, you know, have been forced to have their hours cut or not work at all. So it affects not just the federal employees and federal contractors. It affects millions and millions of people. NNAMDIWe got an email from Perry who says, As a contracted instructor teaching classes for the government, I had two classes canceled during the shutdown worth about $11,000 to me. Eventually, they will be rescheduled. But there is no way to know when nor if I will be the instructor that gets to teach them. What do you think people really don't understand about being a federal contractor, Devon? RUSSELLWell, I believe, you know, with being a federal contractor worker, people don't really understand. It's like we're on the outskirts as far as, you know, what the federal government people directly. It's like, we're like the stepchild of all of this going on. We don't really get the same privileges and people don't look at us the same, when it comes to back pay and everything else like that. So I believe we need to continue to fight to get this acceptance as far as, you know, everybody receiving the same thing since we're basically all doing the same thing anyway. NNAMDIFinally, we got an email from Nancy in northern Virginia who says, Over the last several decades, lots of federal jobs have been contracted out. At my agency, most secretarial positions are filled out by senior citizens hired by a contractor. Those folks are paid little and do much to keep our operations running smoothly. As agencies have been ordered to downsize, more positions are filled by contract workers. It's unfair that they do the work, but don't get the protection of federal employment. And that is what Jaime Contreras is trying to do to make sure they get the appropriate compensation. He's the Vice President of 32BJ SEIU, a union that represents many federal contractors. Jaime, thank you so much for joining us. CONTRERASThank you for having me. It's a pleasure. NNAMDIDevon Russell is a security officer at the Smithsonian Museum of Natural History. Devon, thank you for joining us. RUSSELLThank you for having me as well. NNAMDIWe're going to take a short break. When we come back D.C. United will now exclusively air its games on a subscription streaming service. What does that mean for current and future fans? I'm Kojo Nnamdi.